Dhanu Mua is the special prasad offered on Dhanu Sankranti. It is made from 'paga' khai, which is a form of puffed paddy rice mixed with cashew nuts, coconut slices, ghee and jaggery. While paga khai or ukhuda is very commonly consumed/used as prasad in most Odiya households, the Dhanu Mua is considered a delicacy. The most famous shop selling this is Baiya Kora Khai / Baiya Khai Ghara which is situated in Old Town, Bhubaneshwar. 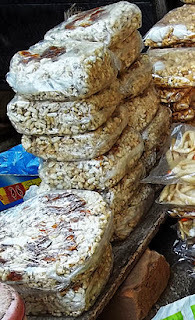 The Kora Khai sold here is also offered as a prasad at the Lingaraj Temple. very new to me. just stopping by to wish you a happy new year! Hey there just ωanted to give you a quick heads up. browser compatibility but I figured Ӏ'd post to let you know. Thee design and style look great though! Hope you get the problem fixed soon.